The woman who died after being struck by a generator that fell off a truck in Sussex on Monday (August 8) has been named. Emma Beeney, 40, was walking with her husband Rob, 44, at around 7am when she was hit outside Etchingham church on High Street. The Army warrant officer of Willow Close died at the scene and her husband, who is an Army chef, is in hospital in a stable condition having suffered serious injuries. 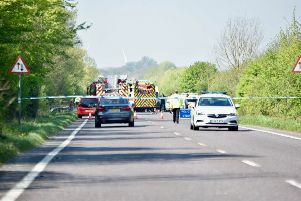 A 42-year-old man from Ashford, Kent, was arrested on suspicion of causing death by dangerous driving and is in custody. Eyewitnesses said a man was seen jumping over the church wall to avoid the generator. Etchingham Parish Council vice-chairman Annette Childs said the whole village has been shocked by what happened. “She was known by a lot of people in the village but it’s a very tragic event,” she told the Observer. “We’re a very close knit and very small village and I think people will be very saddened by this incident. The couple from Willow Close were believed to have been walking to the railway station when they were hit by the generator. Etchingham Parish Church will be open all day on Saturday (August 13) for people to light candles in memory of Mrs Beeney and vicar Sally Epps will lead a service in the morning at 10.30am. Cllr Childs expected a lot of villagers to attend. “I know how saddened everybody is in the village as we’re a close knit community and it has been terribly shocking for everybody, whether they knew the family or not,” she said. Emergency services were called to the scene near the level crossing just before 6.55am, after reports of two people being struck by a generator. Commuters performed CPR and first aid on the injured pair before the paramedics and an air ambulance arrived. The generator came loose from the rear of the Ford Transit Flat Bed lorry near the level crossing. Chief Inspector Rosie Ross said: “This was a tragic incident and we are investigating the circumstances. Bistro@TheStation owner Paul Collins described the pair as ‘amazing people’ and everyone was in shock. “Rob and Emma were a big part of the community. They did all the food at the summer fete,” the 44-year-old told The Daily Mail. “They did a barbecue during the day and a curry at night. They were massive participants in everything that the village does. “They are amazing people. Everyone is in real shock. Paul Hunt arrived at the scene soon after it had happened and said what he saw was ‘horrible’. “I came upon the incident minutes after it had happened and there were a lot of people milling around,” he told the Kent and Sussex Courier. “The generator was lying on the pavement and it also had a large pneumatic breaker attached to it. “The lorry was parked up past the level crossing. The injured man was on all fours and had a head wound. “The lady was in bad shape – she was lying on her back and was having trouble breathing. Anyone with information is asked to email collision.appeal@sussex.pnn.police.uk or ring 101, quoting Operation Blaydon.